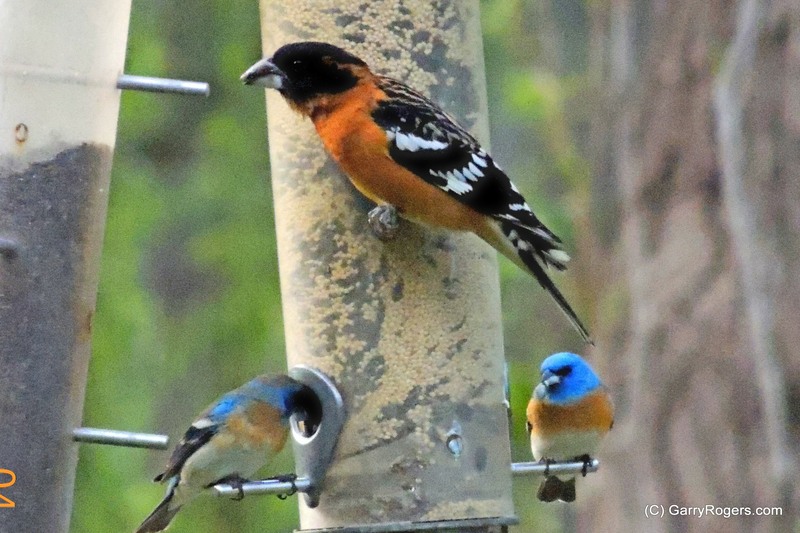 Black-headed Grosbeaks aren’t as large as Robins, but they are big enough to have trouble perching on bird feeders. Young birds flutter and flap as they learn to use the feeder. Grosbeaks eat berries and insects, but their large beaks are especially effective with seeds. The birds arrive in spring, build nests, and stay for the summer. They prefer a combination of large deciduous trees and lower shrubs. Their song is a rich warble similar to a robin’s but softer, sweeter, and faster. Nest: Female builds an open, loose nest in a shrub or tree and lays 2-5 eggs. Young birds leave the nest after 12-14 days but can’t fly for two weeks. They hang out on nearby branches and parents feed them.